A special event has taken place at the Jubilee Library in Brighton to mark a major expansion for local DAB digital radio in Sussex that has seen over 300,000 listeners added to the local DAB coverage area in the county. 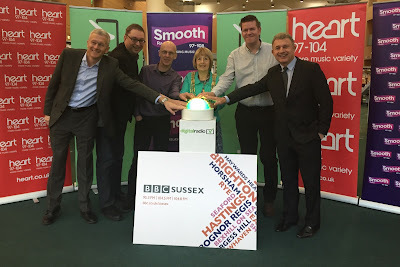 The Mayor of Brighton & Hove, Councillor Lynda Hyde (pictured, centre), this morning marked the event, urging all digital listeners in Sussex to retune to ensure that they could continue to listen to their favourite local BBC and commercial stations - BBC Sussex, Heart Sussex, Smooth Radio Sussex, Capital, Gold, KISSTORY, heat, Gaydio and Smile Sussex. 330,000 listeners have been added to the Sussex DAB multiplex coverage area in and around the new transmitter sites in Crawley, Newhaven, Heathfield and in the Sussex Weald, north of Shoreham (Truleigh Hill transmitter). Early in 2016 a further two digital transmitters will be added bringing over 40,000 listeners in Midhurst and Rye into DAB coverage and in August 2016 a seventh digital transmitter will add a further 50,000 listeners in Horsham. But listeners who were already able to listen to local stations such as BBC Sussex on DAB need to retune their radios this morning, as local DAB services have moved to a new frequency on VHF Block 10B. This is because local DAB uses a single frequency network to cover the whole area, and the old frequency wasn't suitable to cater for the coverage boost into northern parts of the county. Once local DAB roll-out in Sussex is complete next year, the seven new transmitters will expand DAB coverage on the county roads by over 250 miles increasing DAB coverage from 58% to 96% of the Sussex road network. Digital Radio UK has provided the following retuning advice to affected listeners in the Sussex area: "Simply press the auto tune or auto scan button on your DAB digital radio or go into the menu and press auto tune. If this does not restore all services, then listeners are recommended to run a full scan on their DAB digital radio. For advice on how to retune your DAB digital radio go to: http://www.getdigitalradio.com/retune ." You can find out more about local DAB coverage in Sussex, plus details of the transmitters being used via this downloadable pdf from the Ofcom website.